September 2011 (Mexico, Missouri) - While precious metal refineries have traditionally only served industrial businesses and large operations, Arch Enterprises is equipped to refine smaller lots of dental gold and gold items from individual households. 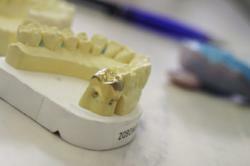 Now that the price is approaching $2,000 USD per ounce, the gold refining company has expanded capabilities to serve more markets that sell gold including the dental field and individual households with gold items. "The increasing gold prices are resulting in people questioning what gold items they have to sell and where to sell their gold," said Stacy Slater, national sales manager for Arch Enterprises. "Often refineries do not make it on the list of places to sell gold, which is unfortunate because we are most likely going to be able to give customers the highest returns. The problem is that not all refineries will work with the public or may have very high minimums in place. Arch Enterprises does not have a minimum on most gold items." In 2009 Arch Enterprises improved the gold refining technology at their precious metal refining facility when gold reached over $1,200 USD an ounce with XRF analytical testing. This machine excites the ions in an item with a florescent x-ray, creating a comprehensive composite that accounts for 100 percent of the metal content without damage. The company uses the testing technology on gold that is not marked, such as dental gold, where it can be difficult to determine the purity with basic testing equipment. "Many gold buyers do not have the ability, facilities, equipment, technology or permits to recover precious metal. By making our refining services available to a wider market of consumers and educating them about precious metal refining, mostly through our precious metal refining blog, we hope to reach a greater number of people that will choose refining," said Stacy Slater. Arch Enterprises has the technology and capacity to handle large and small volumes of high and low grade gold material. The company offers between 70 and 90 percent return on gold items and can sometimes offer more than 90 percent on large shipments of gold. The company has worked with dental laboratories, industrial operations and medical facilities and maintains an A+ rating from the Better Business Bureau. Free quotes are available from Arch Enterprises over the phone at 800-835-0478 or on their contact form at http://www.archenterprises.com.